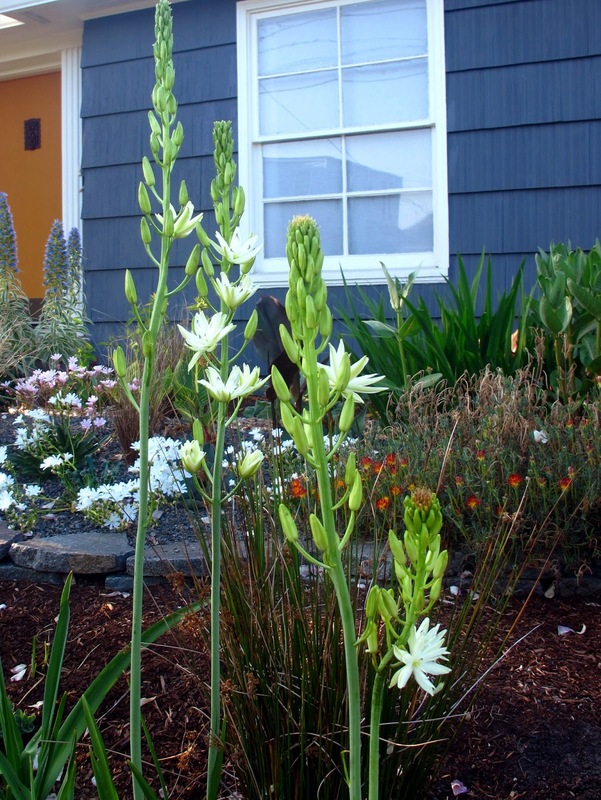 Last fall I planted two types of Camassia in the rain garden, one blue and one white. I thought they would bloom together but the blues popped out in April and the whites are just now opening up. Thank goodness for these kinds of misunderstandings. It's so much nicer to enjoy them individually. Also filing under things-I-didn't-know, the Korean lilac smells amazing right now. I don't remember it having a very powerful fragrance last year. It's planted outside our kitchen door and walking outside right now is such a wonderful experience. I love spring! So pretty! Uh oh something new to want. I'm the same, when I plant things, I always imagine them all blooming simultaneously, but, in the end, I'm always appreciative of the extended blooming period when their bloom times are staggered. Spring=Awesomeness! Ah, the surprises, fragrant and otherwise, of spring. 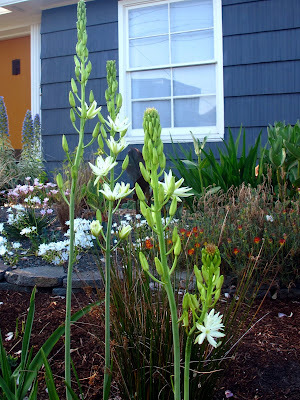 I have only one kind of camassia, a very pale whitish blue the color of skim milk. It has been threatening to bloom for weeks, the foliage is beyond lush, but the buds are only just forming. I'm glad you are enjoying yours at different times and stages! There seems to be a lot of variation in the intensity of fragrance from year to year among plants that are supposed to be fragrant. I wonder if part of it is the maturity of the plant? My clove currant is blooming now and has a rather faint fragrance, while I've read that the fragrance can be quite powerful. I love their height! It looks like your rain garden & gardens are filling out wonderfully! It is a happy spring indeed!